David Welsh was a member of our chapter and a key contributor to the Warrant Officer Cohort. A main stay within National Headquarters, he was an Army Reservist and Historian of the Warrant Officer Corps. His last challenge was that as President of the Warrant Officer Historical Foundation (WOHF). Most of the Warrant Officer History is attributed to his hard work over the years. A great Warrant Officer, husband, father, friend and a great man. The article below originally appeared in the January 2019 edition of the USAWOA Newsliner. National Executive CW4 (Ret) Jack Du Teil asked me to contribute to the Newsliner regarding my friend Dave Welsh. I am pleased to do so. Although I shared USAWOA and social interactions with Dave both earlier and later, my personal friendship with Dave was largely based on our shared work experience – roughly between July 1998 and February 2003. Having retired from active duty, Dave was a member of the USAWOA National Headquarters staff, serving as our membership manager during this period. At the time, I was the USAWOA national executive director. Therefore, we interacted a lot. In addition to the typical work week, we spent many weekends together at the office as well. Our shared experiences ranged from pure association business – such as letters, inquiries, meetings, Newsliner prep, and mailings – to the more mundane tasks of painting office walls, assembling furniture, determining who made the worst coffee, etc. We worked, we had fun, and we came to know one another well. Dave was really invested in the USAWOA member database, and his goal was 100% accuracy – nothing less. Many days Dave was hunched over his keyboard, fingers flying and with the phone cradled between his ear and shoulder. His breaks took him outside for a puff on his pipe – nicknamed “old stinky” by others. Dave’s obsession with accuracy was doubtless a good thing, considering he was our database manager. However, this led to us occasionally butting heads when seeking to extract information from the membership database. This was particularly true when looking for trends or indicators useful for our membership recruiting and retention efforts. In those situations I didn’t need 100% accuracy – just something reasonably close. One recollection of a data pull still makes me laugh. I hatched up the idea of counting how many members were on their third or more membership renewals but were approaching 20 years of service, based on their service entry date. I recall that the USAWOA national vice president and I were looking to see if there might be retention value in developing a program to assist such Members as they transitioned to retirement. I knew the information was contained in the individual member records and therefore capable of being pulled from the database – right? You can guess how this ended. Using a lined yellow pad, a pencil, a manual count, and a calculator, I came up with the numbers. Dave was genuinely upset that he never did get his database query to work properly. However, Dave was far more valuable to me and our association than as a mere number cruncher. My military experience came from the regular Army. Dave’s came from a wide range of assignments in the U.S. Army Reserve, and he was of great help to me. From Dave I learned the difference between our nation’s active duty and reserve forces in matters of organizational structure, promotions, assignments, and pay, and the difference between “full timers,” drilling reserve component Soldiers, and inactive members. This was particularly helpful, as at the time USAWOA was expanding membership within the reserve components. As Jack Du Teil and I spoke about this article, I knew that it would be insufficient for me to merely write about the five years Dave and I worked in the USAWOA office. Therefore, I called upon several others with broader knowledge of Dave’s military career and post-retirement activities. The information they provided follows. (Thanks, guys.) I hope you, like I, will enjoy reading what they have written. CW5 (Ret) Dave Welsh was a truly unique individual, and a consummate professional. Because of his unquestionable integrity, keen mind, and tenacious dedication to duty, he was selected to be one of the very first U.S. Army Reserve Warrant Officers to be placed on extended active duty. As an Active Guard and Reserve (AGR) program Warrant Officer, and assigned to the National Capital Region (NCR) in Washington DC, Dave served as the first Adjutant and Chief of Administration of the newly created Army Reserve Support Operations Center (ARSOC). This was aligned with and organized to provide direct support for the divisions of the Office of the Chief, Army Reserve (OCAR). As this new element began to grow, Dave was given the mission to consolidate the unit into one location, from seven different locations in the NCR. This was no small task, given the obstacles of finding space and physically relocating disparate offices within the NCR. However, Dave was successful in this endeavor, in addition to the numerous other tasks he was assigned. The results of this initiative were significantly improved personnel accountability and the enhanced operational support the unit was able to provide to its Army Staff counterparts. Subsequently, Dave was assigned to OCAR as chief of administrative services, where after a year he was awarded the much sought-after Army Staff Identification Badge. In this position he managed the agency’s awards program, internal operating budget, personnel accountability, and a multitude of other tasks and functions. He also served as the agency’s point of contact (POC) with the Office of the Director of the Army Staff, and coordinated with members of PERSCOM‘s Warrant Officer Division. As an Army Reserve senior Warrant Officer assigned to OCAR, his advice was sought to provide Army Reserve input during the Total Warrant Officer Study (TWOS). Later, he was assigned as the staff officer in OCAR’s Personnel Division responsible for Army Reserve Warrant Officer management. There he developed Army Reserve policy to implement the tenants of TWOS, and later the Warrant Officer Management Act (WOMA). Dave served as a member of the Warrant Officer Staff Advisory Council (WOSAC). He also served on numerous boards, and was asked to make presentations at annual meetings and conferences of major associations such as the Reserve Officers Association (ROA), and USAWOA. Even before becoming the president of the Warrant Officer Historical Foundation (WOHF), Dave was one of a steadfast few who championed the Warrant Officer at every opportunity – from the corridors of the Pentagon to the halls of Congress. He was the principal advocate, organizer, and legally registered agent of the WOHF, from its creation in 2003 until his passing on 20 October 2018. He energetically and continuously served as chairman of the board, corporation president, and its premier historian. In the spring of 2003, the USAWOA Past Presidents Council was challenged by then National President CW5 Frank Meeks to form an independent non-profit foundation, with the mission of “Preserving Army Warrant Officer History™”. In June 2003, a decision was made by the USAWOA to transfer their Warrant Officer Museum fund account to the new non-profit foundation. Thereby, it was hoped to provide a much broader appeal to potential donors, as well as a broader latitude for the utilization of funds derived. It was for these reasons that the organization was renamed as the Warrant Officer Historical Foundation. To distribute funds raised in a manner that supports the goals of education of the general public on the history of the Warrant Officer Corps. 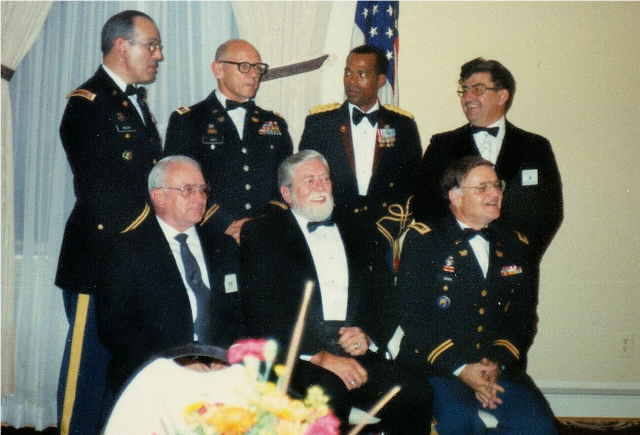 Arlington, VA – October 1990 – CW5 (Ret) David P. Welsh posed with the other six USAWOA Past Presidents in attendance at the 18th Annual Meeting of the Members (AMM) Banquet, held at Fort Myer, VA. Pictured sitting (left to right) are CW4 (Ret) Frank Stamey, 1978-80; CW3 (Ret) Alfred E. Cox, 1975-76; and CW4 (Ret) Don Hess, 1973-74. Standing (left to right) are CW5 (Ret) Welsh, 1988-92; CW4 (Ret) Dennis Jinks, 1986-88; CW4 (Ret) Carl Burnett, 1984-86; and CW4 (Ret) Robert D. Scott, 1980-82. The accomplishments of the WOHF are legion, as documented in the WOHF annual report, published in the November 2018 Newsliner. Further evidence is found on the WOHF website, located at https://warrantofficerhistory.org/– a site lovingly constructed and maintained by Dave until the day he died. No man is an island unto himself, and Dave was no exception. The WOHF is the result of a lot of hard work done by many dedicated people, over many long years. But Dave was its founder, its most dedicated leader, and the guiding light of all who shared his important vision. The legacy of the United States Army Warrant Officer is a record of more than 100 years of dedication and service to the nation. 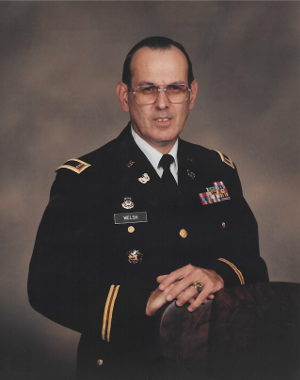 The legacy of CW5 (Ret) David P. Welsh is a personal record devoted to “Preserving Army Warrant Officer History™.” He will be sorely missed by those of us charged with maintaining this legacy. Ray Bell asked me to write something about Dave Welsh, not only as a Warrant Officer, but as a friend and father-in-law. It is my privilege to do so. I met Dave when I was a young Warrant Officer in 1988, at a USAWOA annual meeting at Fort Belvoir, VA. He introduced himself, we seemed to hit it off, and we continued to communicate back and forth. 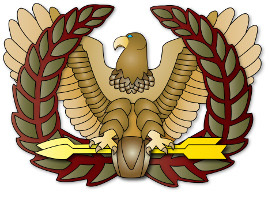 I was stationed in Ansbach, Germany, and very active in the USAWOA chapter there. Through his inspiration (and pushing) I became the Ansbach Chapter vice president, and later went on to become the chapter’s president. Dave continuously mentored and advised me throughout this period. I went on to become the European Region parliamentarian, and eventually the European Region vice president – this is when things began to change. Any time I was back stateside, I would meet with Dave and often enjoy having dinner with his family. This is where I met Dave’s daughter Kim, who later became my wife. Dave continued to mentor me to succeed as a Warrant Officer, and taught me how to advance in my career. He also talked with me about my position as the European Region vice president. In 1990, I deployed to Southwest Asia. Upon returning, after spending 16 ½ years in Germany, I decided it was time to return home. Dave counseled me on all of this as a friend and mentor. I had fallen in love with Kim (unbeknownst to Dave), and it was at this time that we decided to get married. Dave was my best man at our wedding, and I will never forget his toast. In it he said he knew I was coming to the house frequently – but thought I was there just to talk with him. Then one morning he realized I was still there when he woke up! On 7 January 1995, Kim and I were married, and I also gained the best father- and mother-in-law a guy could ask for! Dave and I continued being best friends throughout the last years. After the passing of Kay – Dave’s beloved wife and my mother-in-law – Kim and I began spending more time with Dave in Chincoteague, VA, where he and Kay had retired to and made home. In June of this year, we began to realize how ill Dave was and Kim and I travelled often to be with Dave. In August, we decided I would retire and go to the island, to provide him care and help him recover. Unfortunately, that was not the hosen path, and on 20 October 2018 my mentor, friend, and father-in-law left us and went to be with his beloved Kay. I can honestly say that if it were not for Dave, my military and personal life would have been much different – because of him, my life is richer. Rest in peace, Sir! 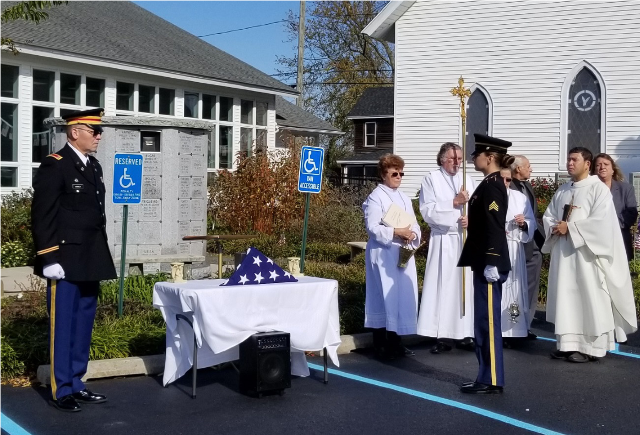 ﻿Chincoteague, VA – 10 November 2018 – CW5 (Ret) David P. Welsh was laid to rest, next to his beloved wife Kay, in the columbarium at Saint Andrews Catholic Church. Born on 17 December 1939, CW5 (Ret) Welsh devoted his entire life to the Warrant Officer cohort until he returned to God on 20 October 2018. At the service the churched was packed, and full military honors were rendered. Pictured left, his son-in-law – CW3 (Ret) Mark Varney – carried his ashes to their final resting place.